In the fall of 1875, the Boston Athenæum’s Fine Arts Committee became interested in purchasing the “very valuable collection of works of art made by the famous Italian collector & connoisseur Alessandro Castellani.” The funds for the acquisition were to come from money recovered on the insurance of the Lawrence Collection of Arms and Armor (see entry 109) that had burned in Boston’s Great Fire of 1872. When the purchase was finalized the following June, the Athenæum placed the collection immediately in the new building of the Museum of Fine Arts in Copley Square, in time for its opening on July 3, 1876. The purchase included nineteen articles of sculptured wood, thirty Italian Renaissance bronzes, and thirty-one pieces of Italian silk textiles, hanging, and embroideries. Of diverse quality, this assortment was typical of several purchases that the Athenæum made in the 1870s expressly for the new Museum, whose early collection was as eclectic in scope as it was didactic in purpose. The name of Alessandro Castellani had been familiar to the Athenæum for some time. Since 1872, the new Museum of Fine Arts exhibitions—held at the Athenæum in 1873, 1874, and 1875—had included Bostonian Thomas Gold Appleton’s collection of over forty Greco-Italian painted ceramic vases that had been discovered, reportedly, “by Alessandro Castellani in Etruscan and Campanian Tombs.” By the summer of 1875 Castellani was in communication with the Athenæum as he contemplated his exhibition at the Philadelphia Centennial the following year, and the Athenæum made arrangements with the Italian marchand-collectionneur to have the crates sent directly to Boston on their way to Philadelphia, with the Athenæum retaining the right of refusal upon inspection of their contents. The shipment came to the freshly completed building of the new Museum in Copley Square about one month before its public opening, followed by the Signor Castellani himself, who arrived in Boston on June 23 and promptly arranged the contents of the crates for inspection. The Trustees liked the collection, Mrs. Lawrence was delighted with it, and the Athenæum’s Fine Arts Committee soon voted to purchase the collection for the new Museum for $8,000. Once purchased by the Athenæum, the Castellani Collection became a part of the newLawrence Collection at the Museum that the older institution was enthusiastically augmenting. Throughout the 1870s the Athenæum was eager to make visible its contribution to the younger institution; it also wished to acknowledge Mrs. Lawrence, an extremely generous donor, in a highly public manner. Following his successful sale in Boston, Castellani went on to exhibit a large number of “Italian antiquities”—marbles, bronzes, personal ornaments, majolica, etc.—at the Centennial in Philadelphia in the fall. Apparently the Athenæum was quite taken with Castellani: it purchased more articles from him in Philadelphia, and the Italian dealer presented to the Athenæum an inscribed copy of the catalogue of his exhibition. Castellani had easy access to a steady stream of objects coming out of the vast holdings of Roman aristocrats and churches, and the Athenæum’s purchases were largely objects of this variety. Discarded, abandoned, or at least willingly sold off in their native land, these objects found a readymarket in America. The Italian textiles included many ecclesiastical vestments—chasubles and copes—as well as altar frontals and chalice veils, all with elaborate decorations; some of them show heavy wear that suggests years of use. The chalice veil illustrated here, embroidered with gold in high relief on violet silk woven with strips of gold, must have come from a splendid set of ceremonial vestments, made in Italy in the eighteenth century for an unknown church. 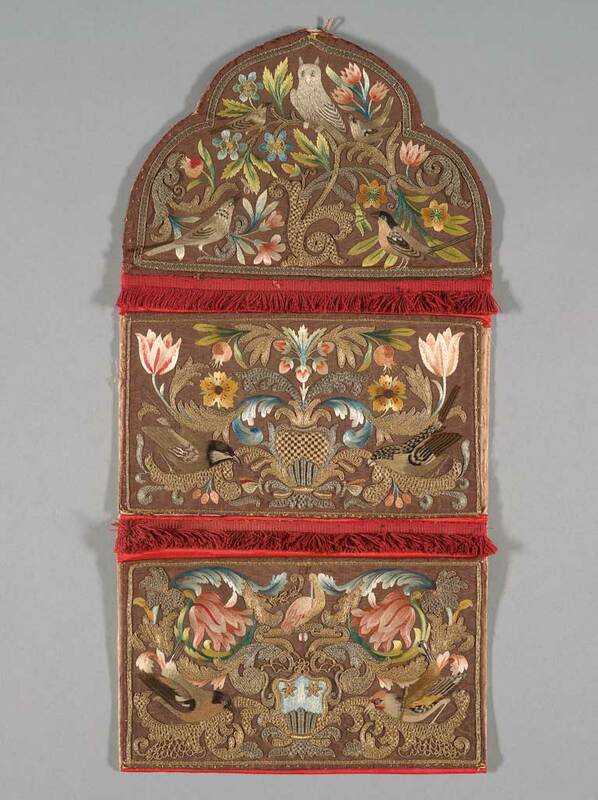 The embroidered letter pouch is thought to date from the seventeenth century. They are a part of the past; and, though in no sense art, the beauty of the material, the richness of the embroidery, and their splendid color, make them grateful to the eye of the artist as well to that of the antiquarian. Most of what the Athenæum purchased for the Museum in the 1870s was relegated to storage in the early twentieth century. The Museum’s focus shifted from the didacticism of its early years to the display of the rare and the original. Some of its early holdings were proven to be outright modern reproductions, but more often they were articles of the past that were skillfully crafted but without the aesthetic uniqueness required by the new standards of exhibition. Most of the Castellani textiles were of this latter category. After several decades in storage at the Museum, some of the Castellani carved wooden pieces returned quietly to the Athenæum in 1953, and most of the Italian bronzes and vases from the collection were sold at auction in 1977. The Castellani textiles have continued to lie in storage at the Museum, preserving the beautiful condition of some of them. Arrested in time for over a century, they attest to the humble aspirations that guided the Athenæum and the Museum in the 1870s, as the collections of both these institutions grew. Hina Hirayama, from, Stanley Ellis Cushing and David B. Dearinger, eds., Acquired Tastes: 200 Years of Collecting for the Boston Athenæum (2006): 342. Copyright © The Boston Athenæum. Henry Bromfield Rogers to Edward Newton Perkins, May 12, 1876; the decision to purchase the Castellani collection is recorded in Fine Arts Committee Records, October 18, 1875. For the Castellani family and their work, see Susan Weber Soros and Stefanie Walker, eds., Castellani and Italian Archaeological Jewelry(New Haven and London: Yale University Press for Bard Graduate Center for Studies in the Decorative Arts, Design, and Culture, New York, 2004); and Geoffrey C. Munn, Castellani and Giuliano: Revivalist Jewellers of the 19th Century(New York: Rizzoli, 1984). Michael Tyskiewicz, Memories of An Old Collector(London: Longmans, Green, 1898), 71, and Margherita Barnabei nd Filippo Delpino, eds., Le “Memorie di un archeologo” di Felice Barnabei(Rome: De Luca Edizioni d’Arte, 1991), 119; quoted in Soros and Walker, 63-64. Catalogue of the Collection of Ancient and Modern Works of Art Given or Loaned to the Trustees of the Museum of Fine Arts, at Boston(Boston: Alfred Mudge & Son, 1872), 32. Fine Arts Committee Records, October 13, 1875, refers to a letter from Martin Brimmer to Castellani, July 24, 1875, and another from Castellani to Brimmer, n.d., which probably initiated the negotiation, but the letters are not in the Athenæum archives. Fine Arts Committee Records, June 23 and July 3, 1876. Only some of the Castellani purchases were installed in the Lawrence Room and the rest were exhibited in the Loan Room, according to MFA catalogues. Edward Newton Perkins, chairman of the Athenæum’s Fine Arts Committee, purchased objects at the fair on behalf of the Athenæum, some of them from Castellani. Fine Arts Committee Records, November 1, 1876. The inscribed copy is Special Catalogue of the Collection of Antiquities, Exhibited by Alessandro Castellani, of Rome, in Rooms U, V, W, Memorial Hall (Philadelphia: Press of Edward Stern & Co., 1876). In the preface by Charles Callahan Perkins, Catalogue of the Collection…the Museum of Fine Arts, at Boston (1872), 3. Walter Muir Whitehill, Museum of Fine Arts, Boston: A Centennial History(Cambridge: The Balknap Press of Harvard University Press, 1970), 9-10. Thomas Gold Appleton, Boston Museum of the Fine Arts. A Companion to the Catalogue(Boston: Roberts Brothers, 1877), 73. Walter Muir Whitehill, Museum of Fine Arts, Boston: A Centennial History(Cambridge: The Balknap Press of Harvard University Press, 1970), 9-10.